Fall and winter weather bring increased rainfall, and if that water collects and concentrates in your backyard, it can wreak havoc on your swimming pool and surrounding deck and patio. Avoid a backyard mess by having proper drainage strategies in place. Toward this goal, one key tactic is a roof with functioning rain gutters that funnel run-off rainwater away from your pool, deck, and other vulnerable spots in your backyard. 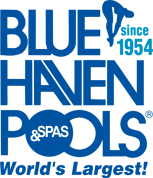 First, let’s review some basics about pool decks and how they handle water that falls onto them. A properly built swimming pool has decking designed to prevent water from gathering on its surface or from running into the pool. Typically, a deck contactor will use one two approaches to achieve proper draining. One method is to build the deck with a gentle slope angled away from the pool. With this slight elevation, gravity pulls water away from the pool. It will flow to an adjacent area, such as a side yard or another section of the backyard, a field or canyon behind the pool or home, or to a drain pipe that carries the water away from that portion of the yard. For example, the water may be directed into what’s known as a French drain, or it might be routed to front of the house, where it flows into the street and then into a storm sewer. The other approach to include one or more drains in the deck, depending on its size and configuration. These plumbing fixtures include area drains or a strip-style drains—commonly referred to as Deck-O-Drains. Water that flows into the drain moves into a collection pipe that carries it away to an area described above, such as a side yard or to the street. By keeping water away from the pool and directing it outside the backyard patio area for appropriate removal, a good draining system will keep excess water from harming your pool and patio. Following rainstorm, as you stare at puddles of water on your deck you might think that your deck is not draining properly. However, the real culprit may be misconfigured rain gutters or a lack of gutters. Here’s what some pool owners may not realize: No matter how good your current deck drainage method is, it can’t compensate for a roof that dumps rainwater onto it. Deck drainage can’t handle hundreds of gallons of rain funneled onto it from the roof above. Without correctly installed, properly functioning rain gutters on your roof, problems can ensue. Your home, yard, deck, and swimming pool become sitting targets for rainwater damage. In colder climates, snow and ice also pose a threat as they melt and turn into water that trickles off your roof and onto your deck and pool area below. A heavy pour coming from one or more areas on the roof will overtax backyard drainage, creating puddles on the deck’s surface or exposed ground. That’s when the trouble begins. It matters if your roof lacks rain gutters or has poorly functioning ones. Without a proper roof drainage, your home, pool, and deck are in possible danger of water damage. With a misplaced runoff from your roof, water can accumulate where it’s not supposed to. Too much water in the wrong place can take a toll in a number of ways. Let’s start how runoff from a roof can threaten your pool. When that excess water falls into your yard—whether onto the deck or onto already-rain-soaked soil—it looks for a place to escape. Sometimes, the invading water will find its way into your swimming pool. That water is dirty. It can be full of debris like leaves, bugs, dust, pollen, spores, and other environmental matter that’s been collecting on your roof and mixed with the rainwater. Now all that mucky slosh is contaminating your pool water, disrupting its water chemistry. You will need to add extra chemicals to kill unwanted algae blooms and microorganisms and to rebalance the water for a safe swimming environment. Additionally, your filter and pool cleaner will get overworked trying to trap and remove the onslaught of floating debris. When it comes to your backyard environment overall, another possible concern with poor drainage is an insect infestation. With your roof sending runoff water onto your deck, your backyard may end up with spots of standing water. If this water does not dry up, these shallow puddles on your deck or soaked soil can become ideal breeding ground for mosquitos to hatch a horde of aggravating pests. As for your deck and hardscape area, the consequences of poor roof drainage can be even more severe. Without functioning rain gutters, your home and deck may experience what’s known as drip line. Drip line occurs when water continues to trickle down from your roof—even after the rain has stopped. A slow drip may not seem like a big deal, but that small, constant bit of water can eventually stain and etch your deck. Damage can occur even to decks made with highly durable material. Ugly stains and etching mar the beauty of your patio area. However, an onslaught of water from your roof onto your deck or backyard soil can create far greater injury—causing your pool deck to actually crack, shift, heave, buckle, crack—or even worse. Here’s how that can happen: As it gets soaked and dries, soil often contracts, expands, or both. If your yard has clay soil, these movements are more dramatic. In some cases, these shifts—especially if they occur time and time again over several years—can cause real backyard trauma: a deck that heaves—lifting up out of the ground and even breaking or splitting apart! The good news is one solution for avoiding these kinds of problems is simple and affordable: Correctly installing a good set of rain gutters on your roof. Rain gutters catch water falling on your roof and direct the runoff away from your yard and pool. Most houses should have a gutter system installed. Even if the house roof is angled so that rain runs off it, a gutter is usually still needed to prevent the runoff from randomly falling around the home and yard. When correctly arranged, a gutter system will strategically direct that runoff to specific locations for safe removal. 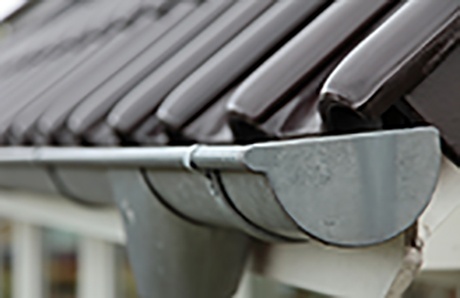 Rain gutters come in a variety of different materials, including steel, vinyl, copper, and aluminum. The long collection vessels are installed around some or all edges of a roof. Completing their configuration is one or more downspouts; this is kind of pipe or tube that connects to the gutters and is typically installed vertically at various corners around the house. 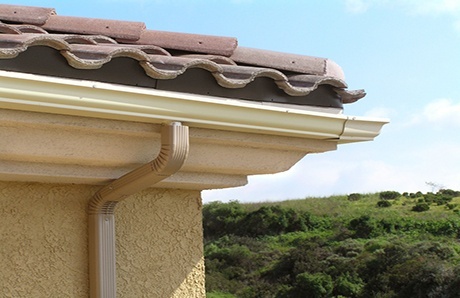 A good gutter installation includes one or more downspouts like the one pictured here. This channel empties water to a strategic endpoint or additional line that carries it away from your house, pool, and deck area. In most installations, a filter or screen is also installed near the downspout to capture debris, such as leaves, to prevent the downspout from clogging up, which impedes water flow. As rain water hits and flows down your roof, it runs off the roof and into these gutters—vs. off the sides of the roof. The gutters are able to divert the flow away from the edges of your home. That prevents or limits opportunities for runoff to fall onto your backyard below. The water moves horizontally through the gutters until it reaches a down spout. The downspout channels the water from the roof to ground level. From there it can be oriented to flow into a side yard or in the direction of a street sewer where it can drain properly. When the gutters are installed, consider the direction of the downspouts: They should point toward the area of your property where they will channel the water out from your yard. After all the goal is to send draining water away from the swimming pool and deck. Never face downspouts toward the pool and deck. A wrong orientation can send a barrage of rainwater onto your pool and deck—causing the kind of damage you are trying to avoid! Installing rain gutters is the first step to improving drainage conditions in your backyard. Maintaining them is also part of the equation. Your rain gutters are going to work hard throughout the year, but they are not immune to clogs. The severity depends on where you live and factors like the number and kinds of trees in your neighborhood. Even with a filter or screen, leaves, pine needles, other outdoor debris can build up in the channels. Tip: Not sure your roof gutters are working right and are sized correctly to sufficiently capture the volume of rain? Check next time there’s a heavy rain. 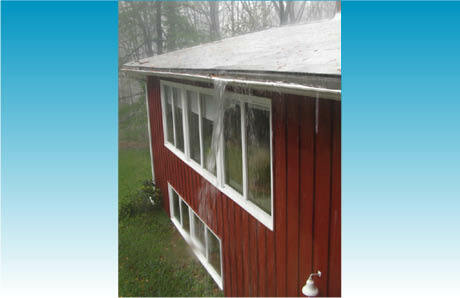 Go outside while it’s raining, and look for “sheeting” (concentrated amounts of water) coming off sections of your roof. Also look to see if puddles are forming on the deck or ground below. Clogged gutters work less effectively, and water cannot leave the roof as intended. As the water continues to accumulate on some kinds of roofs, leaks inside the house below can result. In addition, just like standing water on a deck, puddles on a roof attract pregnant mosquitos looking to lay eggs. Avoid these problems with routine cleaning. In some regions of the country, clean them our at least twice a year—more often if local conditions warrant. Be sure to clean them before the rainy season begins. You can do it yourself or hire a professional. To work as intended, roof gutters need regular cleaning. Here, leaves and debris are clogging the water flow through the gutter. The result: Rainwater is concentrating and coming down a random side of the house onto vulnerable ground below. Having rain gutters in place to direct excess rain water or water from melting snow or ice to a proper drain is essential for your home and property. Your pool deck was built to drain water from rain, but when it must also handle water improperly pouring off your roof, the extra work may be too much and damage may result. So plan on getting a gutter system before the rainy season begins and runoff water makes trouble for your pool and yard. For many homes, depending on the kind of rain gutter, the cost will like vary; for more detailed cost information, see this helpful article. Your investment will be well worth the protection that gutters will provide to your home, deck, and pool from damage wrought by excess water. Your backyard resort should be enjoyed, so don’t let drainage issues detract from its appearance and functionality. Protect your pool and deck, and enjoy them for years to come!